Several years ago, I traveled to Peru where I hiked the Inca Trail, making my way to the ancient Incan ruins of Machu Picchu. The Incas built this sacred place around 1450, only to abandon it 100 years later around the time of the Spanish Conquest. Although locals knew about the deserted city, it wasn’t until 1911 that Hiram Bingham brought it to the attention of the world and the site became an important tourist destination. I have to say the beauty and mystery of Machu Picchu moved me more than anywhere I’ve ever been. The highlight of the day was a climb to the peak of the adjoining and cone-shaped mountain named Huayna Picchu. The view of Machu Picchu from the peak takes your breath away. I guess you’re wondering what Machu Picchu has to do with pizza. Let me explain. I went to Peru expecting to experience Peruvian cuisine and I did have some delicious Latin food while I was there. However, I was shocked and delighted to see pizzarias all over Cusco and Aquas Calientes, the village at the base of Machu Picchu. We enjoyed fantastic pizza at more than one meal. I was looking at pictures from the trip recently and memories of the pizza I had in Peru inspired today’s post. I’m a little atypical in my pizza likes and dislikes. I’ll always pass on pizza with tomato sauce and pepperoni. Give me lots of veg and chicken any day. My favorite pizza in Atlanta comes from Savage Pizza where they make a version of Chicken Florentine Pizza. I can’t resist ordering it every time we walk through their doors. I’m featuring my version of Chicken Florentine Pizza for this post. My favorite part of this pizza is the Parmesan garlic sauce. 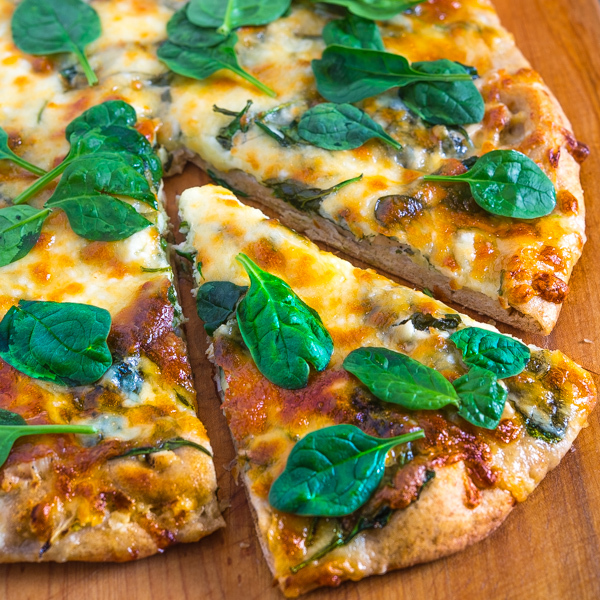 Top a whole wheat crust with the sauce, onions, chicken, spinach, Gruyere and mozzarella cheeses and that’s a pizza! 1. Whisk together water, yeast, 1/2 teaspoon sugar in a small bowl. Let yeast mixture proof for 8 to 10 minutes or until a layer of foam appears on the surface. Add 1 tablespoon of olive oil to the mixture. 2. Combine flours, salt, and 1 1/2 teaspoons sugar in the bowl of an electric mixer. Attach dough hook to the mixer and turn on medium speed. Add yeast mixture to the dry ingredients. Mix until the dough comes together in a bowl. Continue kneading at medium speed for 5 minutes. 3. Coat a large bowl with 1 tablespoon of olive oil. Remove dough from mixing bowl and place in oiled bowl. Cover bowl with a damp towel and let dough rise in a warm place for 60 to 90 minutes or until dough has doubled in size. 4. Punch dough down and knead three or four times. Wrap dough in plastic wrap and refrigerate for 30 minutes. 1. Melt butter in a sauce pan over medium low heat. Add garlic to the pan and saute for 1 to 2 minutes. Add flour and whisk until well combined. Continue cooking for 1 to 2 minutes. 2. Add milk to pan and whisk until sauce starts thickening. Add Parmesan cheese, salt, and pepper. Whisk until cheese is melted. Remove from heat and cool. 1. Place pizza stone in oven and preheat to 450 degrees for 30 minutes. 1. Roll dough to a 14-inch diameter circle. Alternatively, you can halve the dough and make two smaller pizzas. 2. Spread a thin layer of garlic sauce over the dough. Spread a layer of sliced onion and sliced chicken over the sauce. Top with spinach, Gruyere and mozzarella cheeses. Sprinkle with salt and drizzle with olive oil. 3. Transfer pizza to preheated pizza stone and bake for 15 to 20 minutes or until crust and cheese are browning. Let pizza rest for 5 to 10 minutes. Slice, top with 1 cup of fresh spinach and serve. I am completely jealous that you have been to Machu Picchu! That is one on my list of dream trips that I would LOVE to take some day. I would definitely keep Machu Picchu on your list. It is spectacular. Thanks for dropping by, Constance! What a gorgeous picture of Machu Picchu! Breathtaking! The pizza picture are quite breathtaking as well. What a pizza!!! I would definitely order it every time. So glad you shared the recipe so I could make it at home! Thanks! That picture of Machu Pichu takes my breath away – but so do all these photos of your chicken florentine pizza! I’d love to visit Machu Picchu someday! And although I love pizza with tomato and pepperoni, and like it loaded with veggies and chicken, too. This looks spectacular – really good recipe. Thanks. Visiting Peru has been on my bucket list for a few years. I am glad that you had the opportunity to have he experience. I am smiling knowing that the Peruvians and a good pizza joint in Atlanta inspire this creative and delightful pizza. Love it. Peru and Pizza! Obviously a perfect combo because it looks sublime! I am a pizza junkie and will be trying this very, very soon! Thanks, Jim. I appreciate the visit to SBD. I know exactly what you mean! When I arrived at Machu Picchu, I was overwhelmed with emotion. I can’t explain it, but there is an energy there that is very hard to explain. You just have to experience it. I had my fill of Pisco Sours, and passed on Guinea Pig. I never did see a pizzaria. I love a white sauce, and this recipe is one for me to save. I love making homemade pizza and have been looking for this kind of sauce. My other favorite pizza is Margherita. Love the olive oil and can easily pass on tomato sauce. So much great flavor packed into this pizza – it looks fantastic. I like to try new flavor combos for pizza and this will now go on my list for sure – thanks! You have seriously captured my heart with this pizza!! !